Well, I’ve got a few ideas that might help you and I want to go over them. Idea number one, fall in love with the yardage and try to get as good as you can be at that yardage. I’ve got my handy Bushnell Rangefinder here, and I’m 90 yards away. 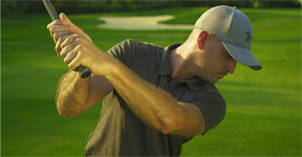 I’ve got a 54-degree wedge, and what I would suggest that all of you do out there is find the yardage that you know you can hit it that specific yardage almost every time. It helps when you’re playing par-5s. It also helps when you’ve maybe hit a bad tee-shot and you can chip out to a specific yardage. In my golfing lifetime, the greatest players I ever played with were great around the greens. There’s a lot of guys that hit the ball really, really good, but the guys that really win and score are really good with a wedge, and they’re really good with a putter. So, we’re going to talk a little bit about hitting a wedge shot, then we’re going to move up to chipping. 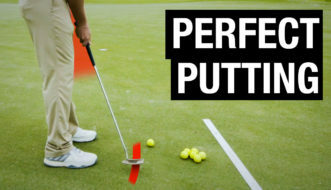 I’m going to give you a couple of ideas about how to hit better speed on your putts. 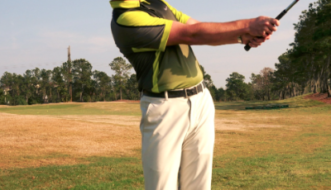 And then, we’re going to close with developing a go-to shot, that when you’re nervous coming down the stretch, you’ve got a chance to break 80, you’ve got to know what you want to do off the tee.